US Navy cruiser USS Vella Gulf making her northbound passage through the Bosphorus. Escorted by Turkish Coast Guard vessel. Photo: Yörük Işık. Used with permission. US Navy cruiser USS Vella Gulf making her northbound passage through the Bosphorus. Photo: Yörük Işık. Used with permission. A detail of soft- and hard- kill systems on board of US Navy cruiser USS Vella Gulf. Photo: Yörük Işık. Used with permission. The time permitted to French intelligence gathering ship A-759 Dupuy de Lôme by Montreux Convention was up on 6 July 2014. We did not witnessed her southbound passage but she must be out of the Black Sea by now. And the US cruiser CG-72 USS Vella Gulf made her second northbound passage this year. 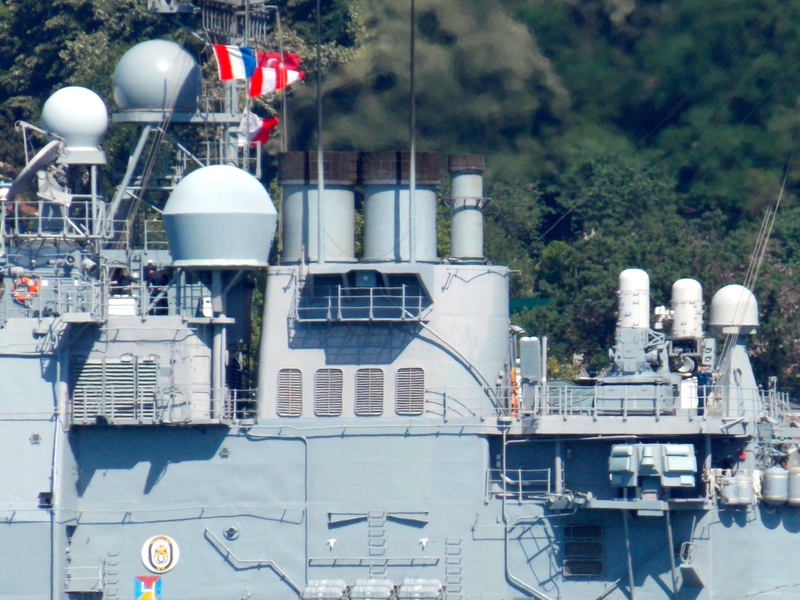 According to the US 6th Fleet, she is going to take part in the Bulgarian led naval exercise Breeze 2014.